Planning a route is a hard thing. For this trip, I haven’t done a ton of research on route. I found with my last trip to TDF that the route naturally unfolded, even though the lines I drew on my map last time were just about right. I probably watched too much Indiana Jones as a kid. So these are the lines that I draw before I even prepare the bike. If you have any route advice, please leave a comment or send me a email! My main route planning is mostly relating to the logistics of shipping across oceans or impassable countries like China and figuring out what I need to temporarily import the moto into a country. 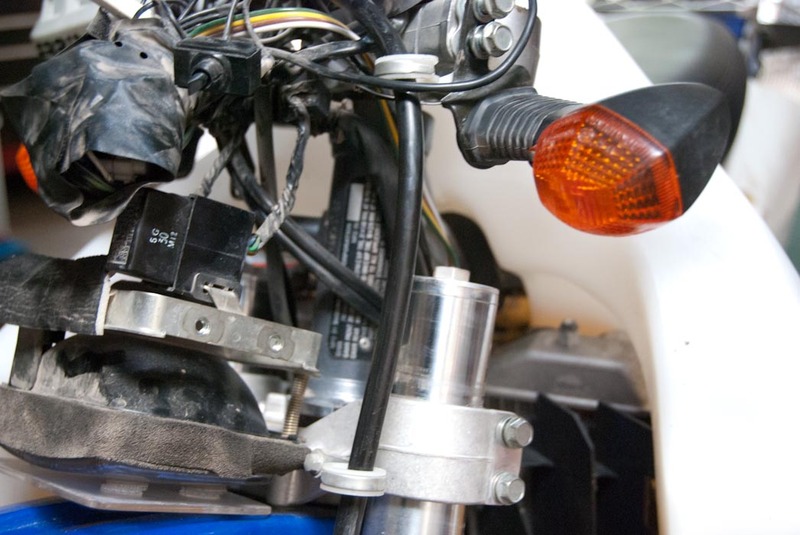 For instance, there are many counties that require a Carnet de Passage, a prepaid bond that proves to the government that you’re not going to sell your motorcycle inside their country. A carnet isn’t required in any of the countries that I visited in Central and South America– but apparently it is needed in a bunch of countries in Asia. Who knows exactly which route I will take. One thing I do know is that I’ll leave to the West and come home via the East and prove to myself that we live on a sphere… or maybe a cone.. still not sure about the other way. I’ve never been good at geometry. On advrider, everyone is always which bike is the best to take for some trip. Yeah, it is a valid question, but to me it doesn’t matter much and people spend way too much time thinking or planning and not enough time taking the trip. That being said, I spent weeks mulling over which bike to take :). 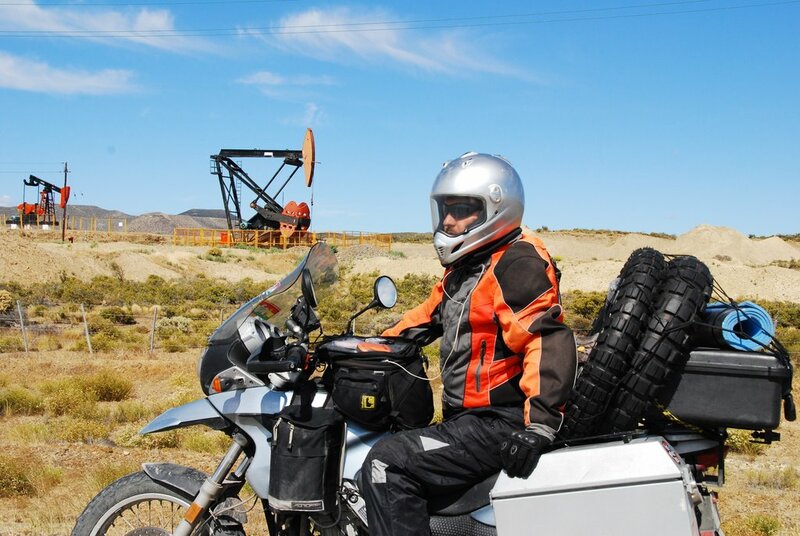 Of course I could take my trusty BMW F650GS that I rode to Argentina. That bike did me well. 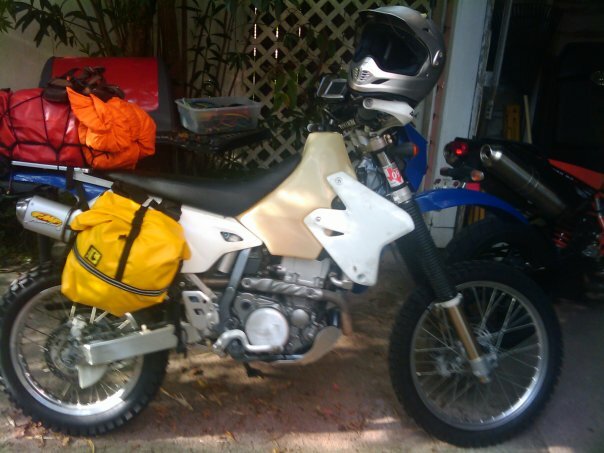 It has about 35,000 miles on it and I traveled through some pretty rough terrain for 17,000 of those miles through central/south America and the only problem I had with the bike was the starter button. Just the botton. Not the motor or anything. Just the starter button. Oh, well, I also blew a fork seal, but that was because I was running away from banditos who had 3 guns on me in Guatemala. One lesson I learned on that last trip is that my F650GS was WAY TOO HEAVY. I rode for several days offroad in Bolivia that convinced me that I needed a lighter bike. The major trade off that people make when taking a smaller bike is that usually your max speed is reduced as well as is your carrying capacity. No biggy. I drive slowly in general and try to stay off the highways. I pack super light.. so for me, the obvious choice was to take a smaller bike. I don’t remember exactly how I converged on choosing this bike as I never met anyone who had one. 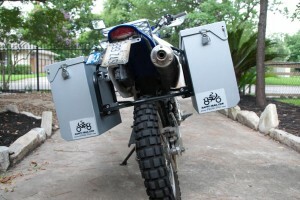 I think it was just the first small bike that I saw online that could mount hard luggage onto it. The DRZ is light at less than 300 lbs (135kg), has excellent ground clearance 11.8 inches (300mm), and has been around and proved to be a reliable machine. Right. 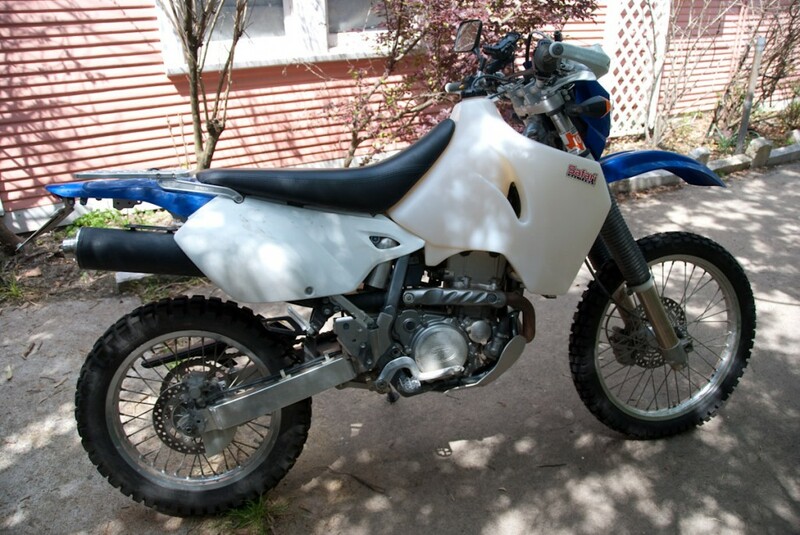 I know what you’re thinking, it is a dirt bike!! Are you dumb? No one runs a dirt bike more than a few thousand miles! Yeah, well, I may be dumb, but according to the few others who have high milage DRZs, it seems like it’ll hold up well. The other fact I came upon is that the same Suzuki motor is used in offboard marine motors for years. 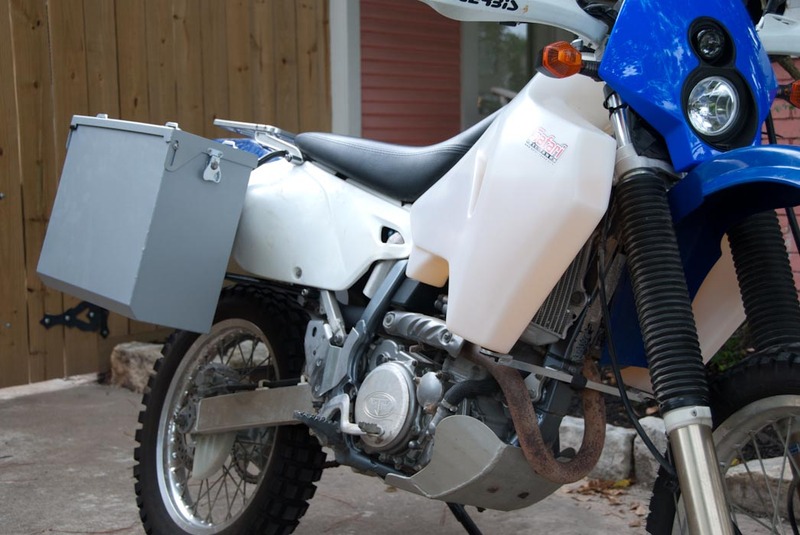 Unfortunately, aftermarket accessories aren’t as good the DRZ as for any BMW motorcycle, but it looks like there are starting to become more and more good vendors out there as “Adventure Touring” people realize that if you want to actually enjoy riding offroad that you shouldn’t do it on a HUGE twin. Specs? Yeah, I’ve got em. That’s what my motorcycle looked like originally. 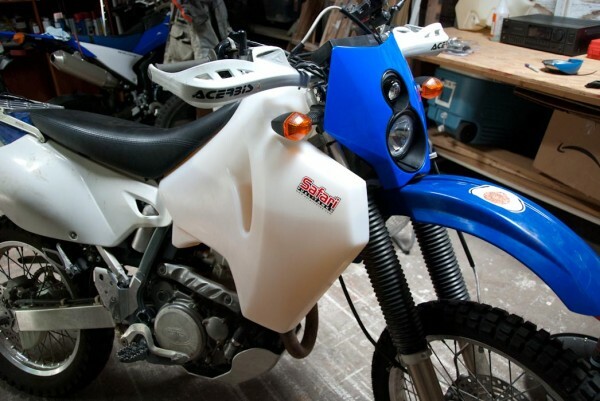 My first real test of the DRZ was when I rode it from Houston to Colorado for the SALARR. She did great! Not only was I comfortable riding for 3 days in a row on the superslab of the highway, but was able to take my bags off the bike and ride some of the most challenging 4×4 passes in Colorado. 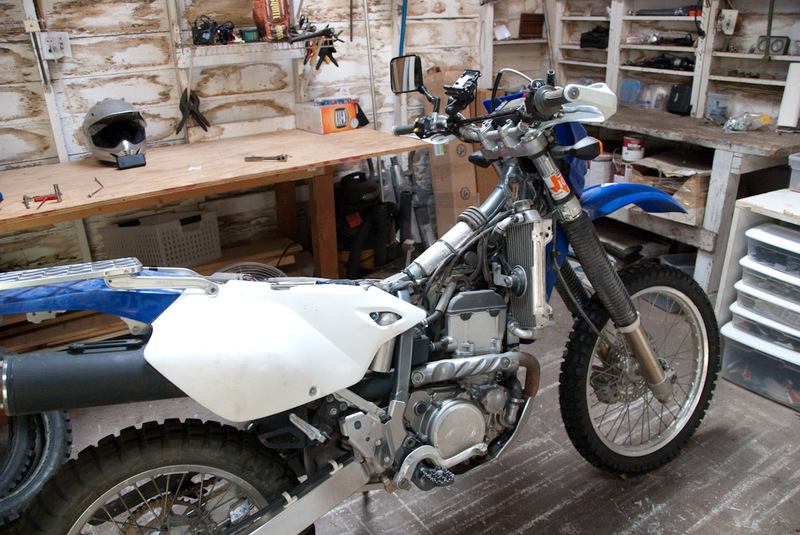 I want a bike that suites the most challenging and interesting parts of my trip the best– the offroad. I’m making a pretty significant sacrifice for highway driving, but I think it’ll be worth it. Afterall, my friend Cecilia said it best, “The nicest people live on gravel roads”. Time for shots. I forgot how expensive they can get, but based on the variety of places that I’m going, I needed to get quite a few but only got my Hep A/B shot today as they didn’t have records of my other shots. Unfortunately when my money belt was liberated from me in Guatemala, it had my shot records. Fortunately, I had a photocopy but didn’t bring it with me. I’m still not sure if I need to get a few other vaccinations. Japanese encephalitis I’m not sure if I’m going to get JE because it is so rare. Any advice? So far I’ve completed my entire Hep A/B series (3 shots) and Typhoid. Wow. It’s already been a couple of weeks since I quit my job and time seems to be flying. I’m still working on getting my Houston life in order before I can even officially start preparing the bike. I’m certainly enjoying my time not having to wake up but my days are still just as full. The only bad part is that I’m still not shifted my spending habits into Frugal Traveler Mode. I’m still going out with friends to bars and to eat. I have to stop and return to my life of rice and canned tuna. It is just a frightening thing to no longer see deposits into my bank account. I have managed to sneak a little bike work by installing my Aqualine 28 liters Safari tank from JustGasTanks.com. They generously gave me a discount lessening the blow of transforming a trail riding bike into a world tourer. The install was very simple. The most difficult part was cleaning the tank of all the plastic shavings that remained in it after manufacturing. There was a bit of flashing and tons of shavings from the various drilled holes like the petcock. 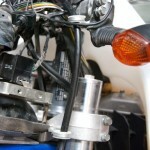 I just followed the instructions of using a little bit of fuel and shaking it around the tank until it comes out clean. This process took about 30 minutes of manhandling the giant plastic beast. The instructions were perfectly clear as I couldn’t really add anything here to be helpful other than to iterate again… remove ALL the plastic shavings. The actual installation took only 5 or 10 minutes of removing the old tank and fitting the Safari tank in place. After filling up the tank completely, not surprisingly the riding characteristics of the bike changed completely. The bike was still nimble enough to ride filled up, but was hardly nimble. I don’t know if it just took a while to get used to the added weight or if was just burning the top gallon lightened the load enough such that it was no longer as bad of a pig. I rode the bike with it about 80% full offroad a bit just in the neighborhood and it was okay. My stock suspension wasn’t bottoming out or anything, but it was fairly squishy. In the future I won’t fill up the tank to the top as I’ll rarely need the 300+ mile range that it affords. The tank is HUGE but didn’t really weigh much more than the stock when it was empty. I still have a ton of things left to do to the bike like install my Happy Trails hard panniers, Trail Tech X2 headlight, and Vapor computer. I also have a bunch of maintenance items to address as well as a few other little things. Both HT and Trail Tech were amazing and decided to donate equipment to support my ride. Trail Tech generously supported my ride by providing me a X2 headlight to install on the DRZ. The stock headlight doesn’t provide much light and the overall aesthetic makes the bike look dated. 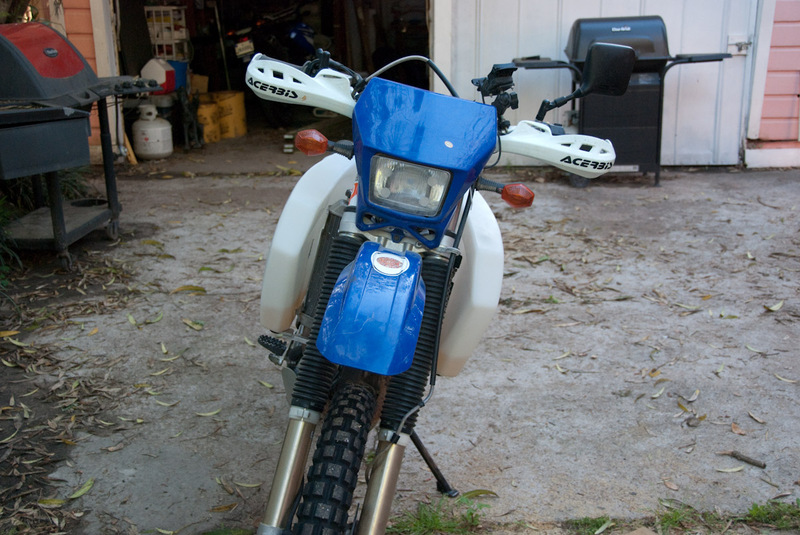 There are a couple of other aftermarket headlight kits for the DRZ, but the X2 was my first choice. I went with their on/off road halogen so that I wouldn’t be blinding cagers as I pass them. 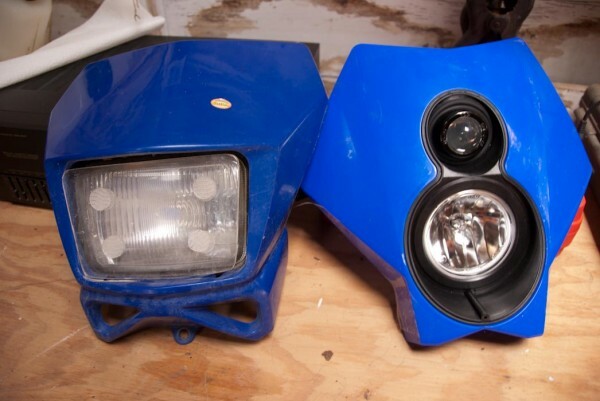 I also wanted a simpler technology if the HID would fail in a remote part of the world. I’ll be able to get a halogen replacement bulb anywhere in the world. The instructions are very clear that came with the kit, so I’ll be pretty brief here with my post and let the pictures do the explaining. It took less than an hour. First I removed the stock headlight (for sale, btw, email me!). The first part of it was pretty easy to remove, just a few bolts. The cage which the headlight was mounted on was a bit trickier. You need to drop the forks. This seems like a big deal but was really quite simple. 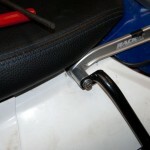 Place the bike on a center stand/jack stand such that the front wheel is hanging in the air. Ready a couple of bricks so that you’ll have a place for the wheel to rest on while you’re working on removing the cage. 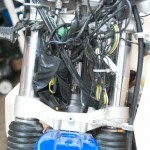 Note or mark where the forks are currently positioned relative to the top clamps. Then loosen them at the top and bottom clamps slowly. Do this slowly because it’ll want to drop out beneath you if you just crank it loose. 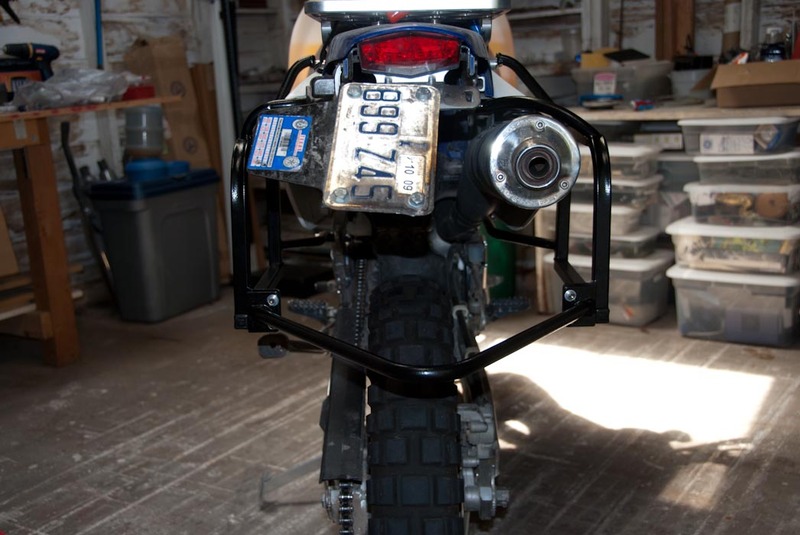 Because of how I had my bike suspended, I wasn’t able to get the front wheel low enough so that the cage would slip out entirely at once. I just got it low so that with a gentle bend the cage could be removed. 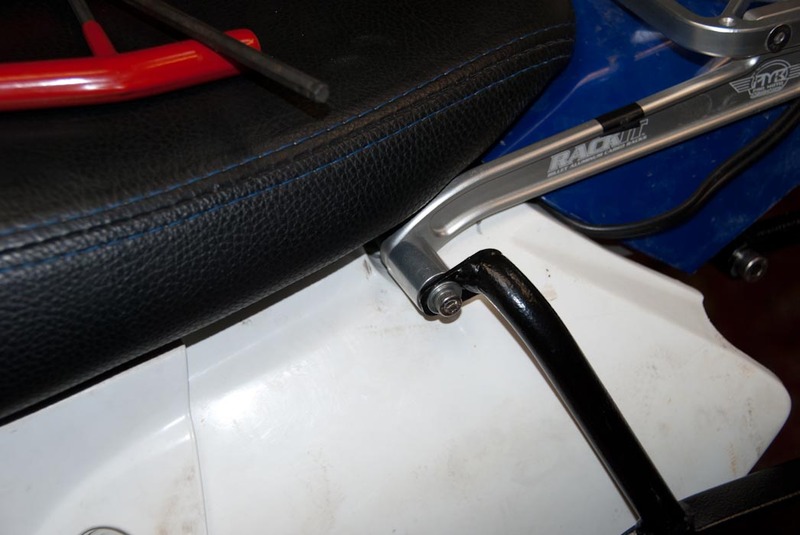 Upon removal, it was easily bent back in position without any appreciable wear to the part. 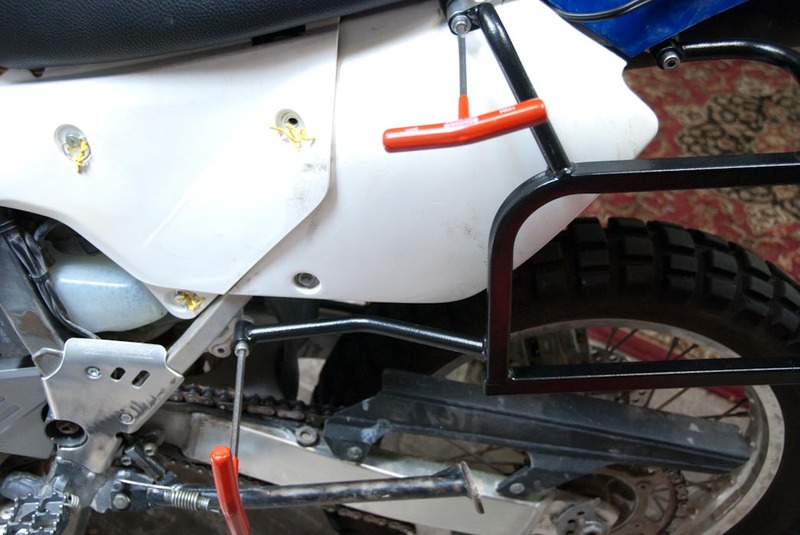 The next step was simply as stated in the instructions, undo the front fender and mount the underpinning plastic part on top of the front fender. 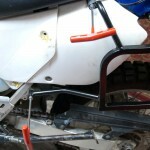 The final step is to mount the headlight on the plastic pins and attach it with the rubber straps. 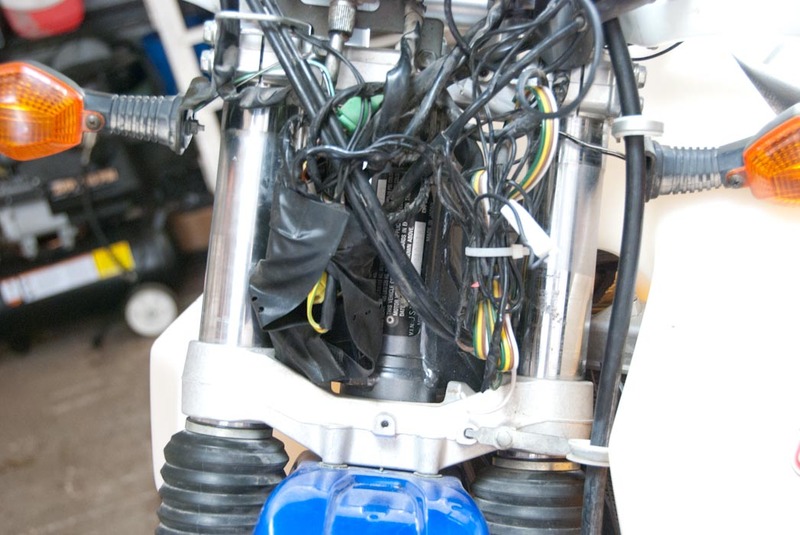 You may have to reposition the nest of wires a few times to find a way to get the headlight to mount flat. It took me about 5 minutes of trying a few different places followed by testing everything by turning the bars back and forth. I could barely wait until the sun set to do the test ride. Even with just the halogen, the difference was remarkable. I’m going to see if I can meet up with my friend who has a stock DRZ light installed to do a live comparison. Not only does it work better, but it is 100x cooler looking and really updates the overall look of the DRZ. I’m going to revisit the installation in a couple of months and see how the Trail Tech X1 Halogen holds up to RTW torture. Here's a quick snapshot of the completed installation. The bags really make transform the bike form trail bike to travel bike. Yay!